As the NYPD begins testing body cameras on some officers, one police department in Connecticut says it's already seen fewer complaints against police in the more than two years that it's used them. All 52 officers in the Branford Police Department are equipped with body cameras and required to use them for all calls expect public service calls. Captain Geoff Morgan considers the program, which started with two cameras, very successful. "In all cases where someone questioned the officer's demeanor, we had video of the encounter and in almost all of those cases, the person decided not to make the civilian complaint," he said. 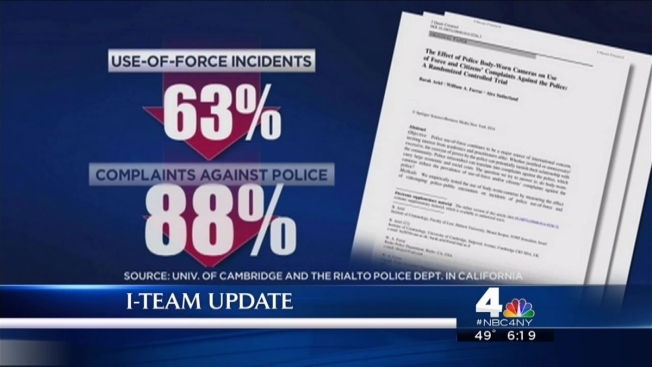 A University of Cambridge study of the Rialto Police Department in California showed similar results. The year-long study showed an 88 percent decrease in police complaints and a 63 percent decrease in use-of-force cases from the previous year. New York City police are launching a pilot program to test officer-worn cameras, Commissioner Bratton announced Thursday. Michael George reports. Morgan showed the I-Team some body camera recordings to show how the interaction works. An officer is expected to turn on the camera even before speaking with the subject, then the entire encounter is recorded. The camera is left on for two minutes after the call is finished. "At the end of their shift, an officer is required to download the video to the computer server," said Morgan. "Videos are kept for 30 days. If they lead to an arrest, then the video is kept till the conclusion of the case, and if it is a DUI case, the video is kept for two years." The 52-officer department generates hundreds of hours of video a week, which has posed data storage challenges. Branford has had to hire an outside company to help store data on hard drives, which is a costly endeavor. "Every agency needs to look at the hidden costs with this technology," said Morgan. "Video storage, its dependibility, where you store it and who maintains it becomes a concern." The NYPD, with more than 34,000 officers, faces a much more daunting challenge. Mayor de Blasio has said that the NYPD will look to store videos with cloud services. Data storage on the cloud generated new worries recently when celebrities like Jennifer Lawrence and Kate Upton were hacked and had their private photos leaked. Tara Knight, a Connecticut criminal defense attorney, is in favor of the cameras, as long as all police departments are forced to follow the same rules. "I think when people know they are being watched, they act differently," said Knight. "I think they are more likely to follow the rules, be more accountable and more transparent." Each camera costs between $800 to $900. To date, Branford police estimate they have spent $50,000 on the entire program. The cost is likely to increase as they will need to increase video storage capacity. In New York city, officers from three precincts with the highest number of stop-and-frisks have started wearing the small, clip-on cameras, part of a $50,000 pilot program. If all goes well, the city and the NYPD could budget for cameras for thousands more officers next year. Sony Cancels Christmas Day Release of "The Interview"